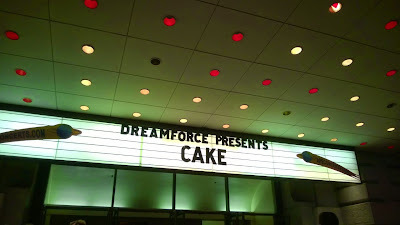 This was my first time attending Dreamforce and subsequently presenting there as well. 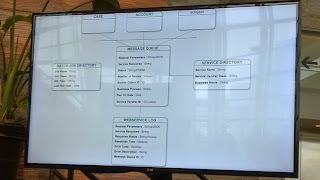 I focused primarily on the development side of things, so spent most of my time around Moscone West. As you may know, I'm an active member of the Salesforce StackExchange site. I find the format useful for asking and answering Salesforce specific questions. One of the time consuming things about the site is trying to replicate an askers environment and then communicating the solution back in the answer. 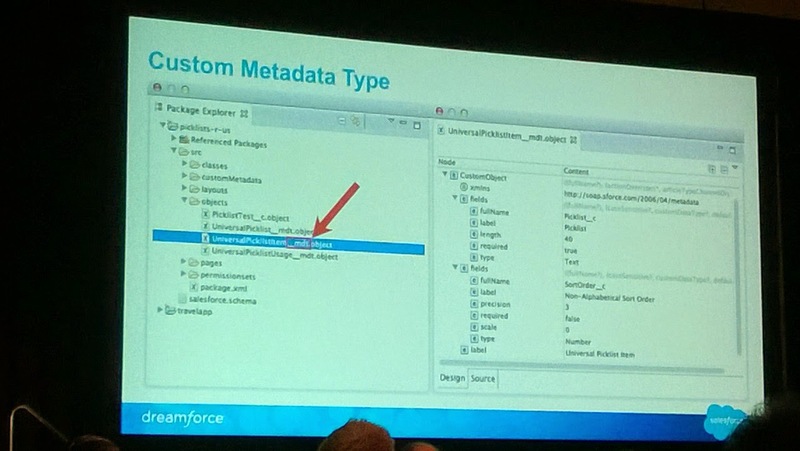 External Objects allow you to view and search data from an external system as though is was a native custom object without actually loading all the data into Salesforce. Configured under Build > Develop > External Objects and ExternalDataSource. The main advantage of not storing the data in a custom object is that it does not count against the Org storage limits and you don't need to try and keep the data in sync. At this stage data can't be updated in the data source. Odata Odata limits apply on single round trip size - 4 MB. Total size of continuation links is 8MB. Used as field relationship? Yes, with some limits - Can't be used in a Master-Detail relationship. Are updates from Salesforce synced back? Read Only at this stage. Where a standard custom object has the __c suffix, external objects have the __x suffix. Limited to 100 External objects per org. SOQL queries often take up most of the CPU time. The Developer Console Execution Overviews Timeline is a great way to check a transaction to see where the performance issues are. Open the Apex log and use Debug > Switch Perspective > All or Analysis. An alternative to using Outbound messages using a custom queue implementation. Independent batches that monitor a message queue and invoke the applicable service handle to send the message out and process the response. 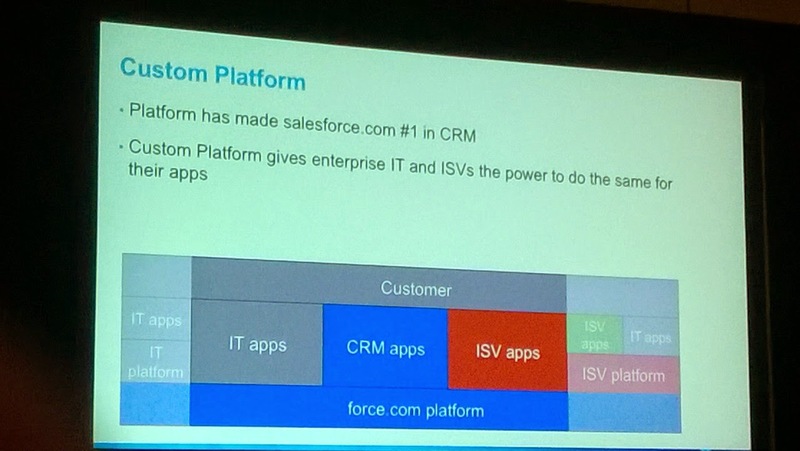 This session will provide an overview of Platform on the Platform, including demonstrations by sfdc partners of features built with the first of our three major features: Custom Metadata. Custom Metadata are similar to List Custom Settings except that the records can be packaged, installed, deployed and managed as metadata. We will show how for the first time, sfdc customers and partners will be able to create their own metadata records and your own platform. Batch Jobs - returns ID that can be monitored, recursive calls, only 5 active jobs, can't be ordered. 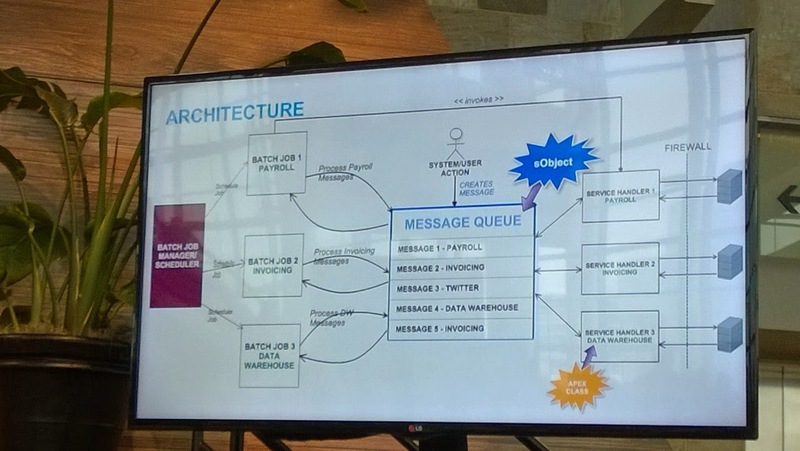 Batch Jobs : With FlexQue. Can you reorder Jobs from code or give them a priority? Appears not. Can't abort holding jobs using the UI, need to use System abort. Supports more than just primitive arguments that @future methods do. Less overhead than a Batch job as there is no start method to go through the aync queue. System.enqueueJob() - returns Job ID. So you can monitor progress. Can be chained together, which future jobs can't be. Can have 50 Queueable jobs. Presenter: Josh Kaplan. Session Video. Due sometime in 2015 as an Eclipse plugin. Sounds like it will be a paid SKU for a sandbox org. 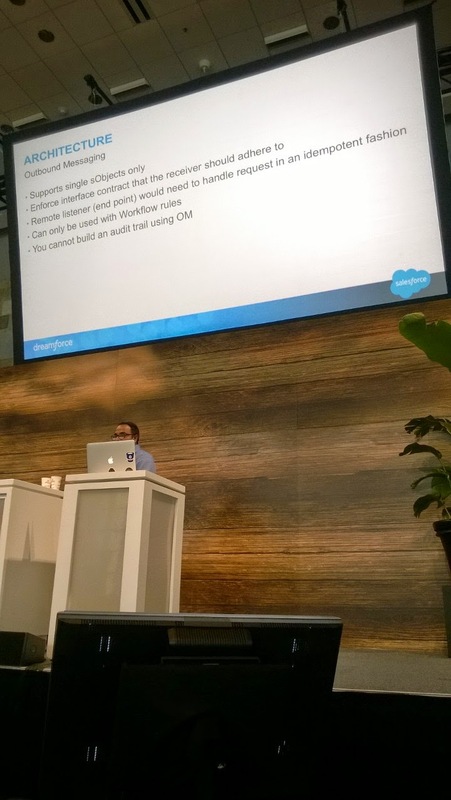 A great session where you can ask questions of the Salesforce developers. Ridding your Apex code of pesty bugs improves the quality of your Salesforce implementation and increases the predictability of your application's success. Catching those bugs early saves time and money and having the proper skills to do so when you start development saves even more. 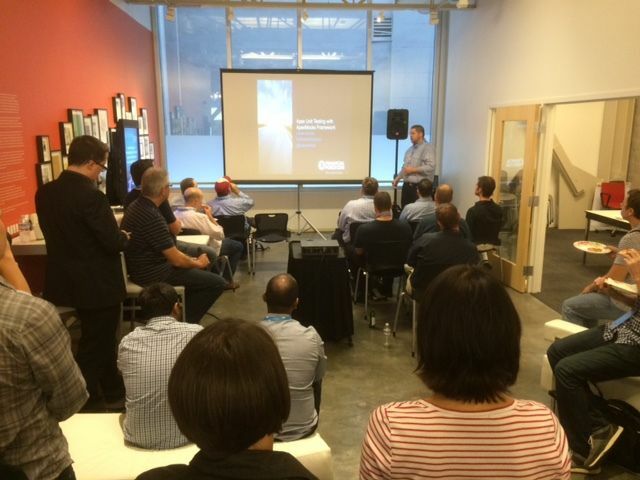 Join us as we cover contract programming, assertions, and enhanced logging and notification. I was surprised to hear about the meetup scheduled during Dreamforce. It was a really interesting session on a mocking framework called ApexMocks. 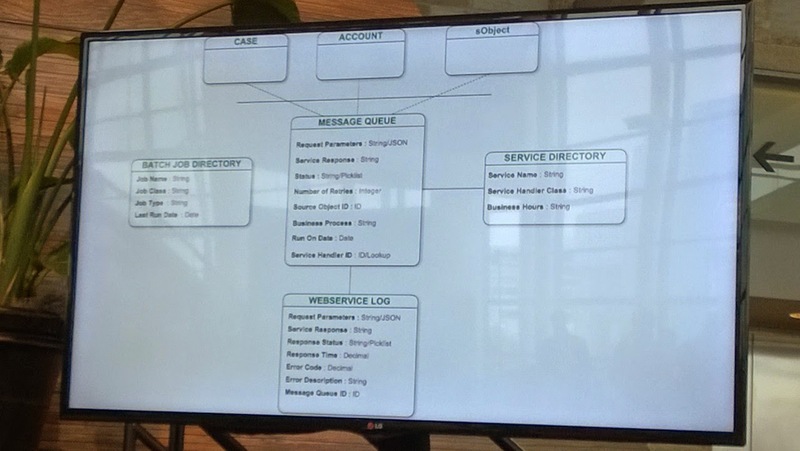 I gave a breakout presentation on the WSDL2Apex component of the FuseIT SFDC Explorer that increases support for calling SOAP based web services. 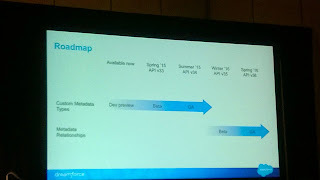 See Dreamforce 2014 Presentation - Improved Apex support for SOAP based web services, which includes the session video and slides. I had a number of shirts to give out, which was easily accomplished on the first day. It's a great way to get talking to people. The on site breakfast on the Monday was a selection of fruit and granola (muesli with more sugar or other sweeteners) bars. Lunch was no longer available in Moscone West or the Yerba Buena Gardens around 12:30 pm on the Monday. Subsequent days I had better luck with the Moscone West expo area around 11:30am. It tended to be prepackaged, so you could grab something and eat it later easily enough. There was a choice between Bruno Mars and Cake. The food options were really good inside were Cake were playing. I'd recently picked up a Surface 2 and already had the type keyboard acccessory to use with it. Combined in Onenote it worked well as an all day not taking device. 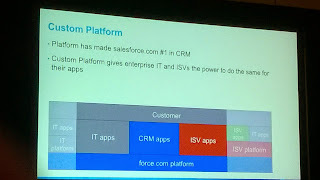 I was also able to use it to complete some of the labs using Salesforce from the built in IE browser. There were a few qwirks with using the developer console. Salesforce gave out a coupon code for first time users of Uber with the $30 credit for the first trip. I set this up with Uber on my phone before leaving New Zealand using my local credit card and cell phone number. On arriving in San Francisco I picked up an AT&T SIM card to avoid excessive international roaming charges. When I tried to book my first Uber ride they sent a confirmations SMS text message to my NZ cell phone number, which I wasn't able to receive due to switching SIM cards. I could have swapped the SIM cards to get the message, but found it too much of a hassle to try and accomplish in the street. My phone needs a pin or similar to pop the SIM card out. So, moral of the story, wait to register for Uber until you get your local SIM if you are going to switch. I was fortunate enough to have booked accommodation early through the Dreamforce website so I was walking distance to the conference. One surprise here was the payment going through my personal credit card that I presented at check-in for incidentals rather than the company credit card that was used on the Dreamforce website to request the accommodation. Hire a bike and ride over the Golden Gate Bride to Sausalito or further on to the Red Woods. I made a day of it and cycled back as well. If I'd known it was there I would have visited the Bay Model Visitor Center. Coit Tower - some good view over the city and harbour.